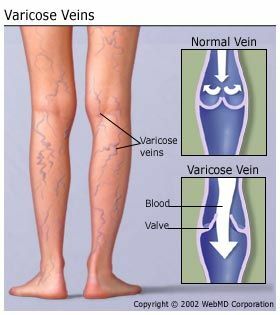 Varicose veins usually announce themselves as bulging, bluish cords running just beneath the surface of your skin. They almost always affect legs and feet. Visible swollen and twisted veins -- sometimes surrounded by patches of flooded capillaries known as spider veins -- are considered superficial varicose veins. Although they can be painful and disfiguring, they are usually harmless. When inflamed, they become tender to the touch and can hinder circulation to the point of causing swollen ankles, itchy skin, and aching in the affected limb. Any condition that puts excessive pressure on the legs or abdomen can lead to varicose veins. The most common pressure inducers are pregnancy, obesity, and standing for long periods. Chronic constipation and -- in rare cases, tumors -- also can cause varicose veins. Being sedentary also may contribute to varicosity, because muscles that are out of condition offer poor blood-pumping action.